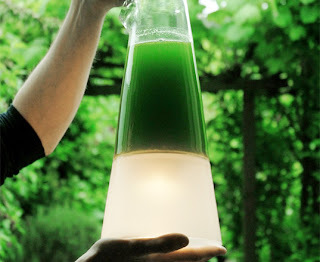 Algae, due to their composition (half of algae by weight are lipid oils) is considered as the new super fuel. In 2010, scientists from Yansei and Stanford University pioneered a technique to use this energy. Inserting gold electrodes into photosynthesising organs of algal cells, algae energy can be stolen. Thats why the device is called Latro (meaning thief in latin). Lantro requires only sunlight, carbon dioxide (Co2) and water. The energy is stored in a battery ready to be called upon during hours of darkness. But is not just a lamp, owners of Latro are required to treat the algae much like a pet: feeding and caring for the algae.